1. 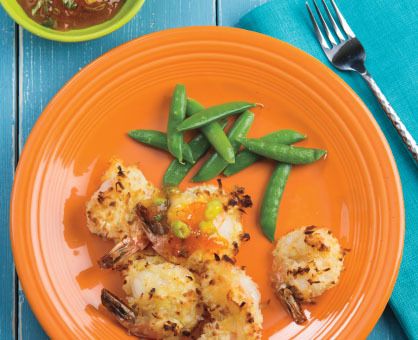 Prepare Coconut Shrimp: Preheat oven to 375°. Spray rimmed baking pan with nonstick cooking spray. 2. Place coconut in wide, shallow dish. In separate wide, shallow dish, stir flour, cornstarch, baking powder and salt until well combined. In small bowl, whisk eggs; add eggs to flour mixture and whisk until well combined. Add ice water and stir until well combined. 3. Holding shrimp by tail, dip shrimp in flour-egg batter to coat both sides, allowing excess batter to drip off; dip shrimp in coconut to coat both sides and place on prepared pan. 10 minutes longer or until golden brown. 5. Meanwhile, prepare Fruit Dipping Sauce: In small bowl, stir all ingredients until well combined. Makes about 1 cup plus 2 tablespoons dip. Let shrimp stand 5 minutes before serving with dipping sauce. For a healthier version, replace bacon with turkey bacon, rotisserie chicken with shredded, cooked boneless, skinless chicken breast meat, cheese with reduced fat or fat-free cheese and sour cream with plain nonfat yogurt.